While there are lots of uses for this technique (non profits, associations, politicians, etc.) mostly I am talking to you, my dear Authors! It is always a great idea to see what national companies with huge budgets are doing and how they are rolling out campaigns that we could copy. In the author world, a street team is a group of people who volunteer to help you with “boots on the ground”, either literally or digitally. They sometimes receive compensation like increased access to you, free books or simply just to feel good about supporting someone or something that important to them. They volunteer their time and talents to be a part of something bigger than just themselves. Mary Kay is a direct sales model business. Women (mostly) sign up to be a “Mary Kay Lady” and sell cosmetics locally to friends and family through a printed catalog. The best ones don’t stop there though, they actively work to grow their business and find clients outside the circle of their own contacts. 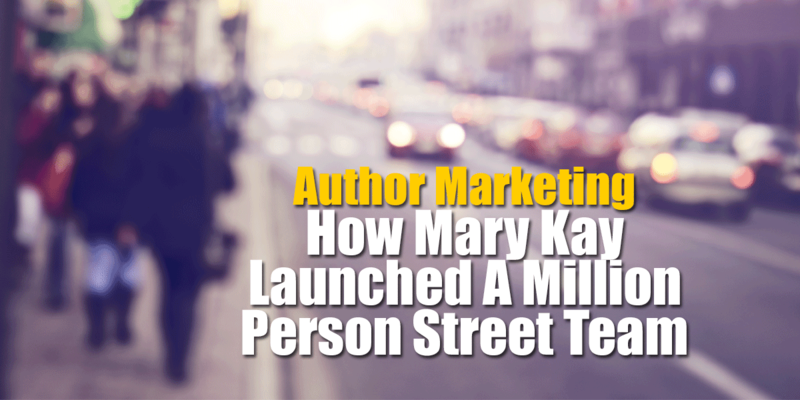 According to their website, Mary Kay has millions of women who are either actively or have in the past sold their products. How Does This Matter To Authors? What really stood out to me was that it was personalized. Debbie is Southern and so she addresses everyone funny (in the BEST WAY!) She tells me a little bit about the lip gloss and that the “Limited Edition Mary Kay Lip gloss that are SPECIFICALLY made for our MK Foundation that fund Women’s Shelters and Cancers that effect women (Breast and “female”)! 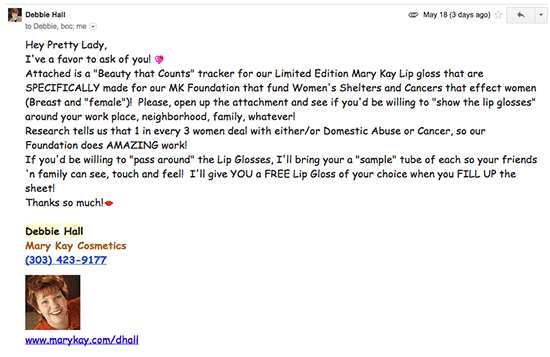 So buying that lip gloss would help women’s shelters…awesome but what’s in it for me, or more specifically for my friend Debbie who I want to support in her business?!?! Well they sent out a signup sheet too! VERY low tech…not a website, landing page or anything else, just a flyer where you can ask your friends if they will sign up to buy one. Street Team Tip: What they are doing here is allowing Debbie to grow her contact list. That said, I think they are missing a contact field like either email or phone number (Debbie is not afraid to jump on a call so for her I would add phone). Functionally the street team (me) would go around to MY friends and family and get a pledge that they would buy a certain number of these lip glosses to support women’s shelters and health issues. You could ask your street team to get people to agree to buy your book on Amazon or in the stores. *When one of my books hits either Amazon or BN’s top 100, I’ll donate $3,000 to charities such as: St. Jude’s Children’s Hospital, Doctors without Borders, Reading is Fundamental, and the American Heart Association. *When a book hits the top 20 at either Amazon or BN, I’ll double the donation. Note how she uses the word “we” a lot like she and her readers are on the same team? That helps to increase that feeling of “belonging to something” that matters. You are helping first responders AND CJ Lyons at the same time. Feeding your “street team” should be fun! It is vital that they enjoy what you are asking them to do AND that they feel that they are really helping you to succeed. In part, you become their favorite cause to support. Pottermore – Pottermore is a site that JK Rowlings and Sony developed to extend her books online. There she releases new content, holds contests and gives her readers behind the scenes access to her and the Harry Potter empire. Something like this is a great way to scale your street team. Only allow access to all this great content if they agree to help support you! Facebook groups – I know, you are thinking you are writing all the time, how are you going to make a huge website like that? Well Facebook has a totally free and easy to use solution for you. Set up a Facebook private group that only people who are on your street team can access. This will give them the “behind the scenes” contact they crave while also giving you a spot that you can announce what you would like them to do! I listen to the author podcasts just like you do and I have heard street teams mentioned often. It is said all happy and chirpy by someone who is pushing book sales through a group of people the author considers friends. What they don’t tell you is that it is hard work. That growing that following of rabid fans takes time, but that it is so worth it in the end.